It has now been two Dave Schultz tournaments in a row this year in which RaVaughn Perkins (NYAC) has returned from an injury. Last February, Perkins entered (and won) the Schultz following an eight-month hiatus from competition due to a spinal fracture that became exacerbated while he attempted to qualify for the Rio Olympics. He next competed in back-to-back overseas events, culminating with a bronze medal at the Grand Prix of Zagreb in Croatia. But it was on that tour when Perkins noticed a grab in his shoulder and before long, both shoulders became an issue. He still competed at the World Team Trials six weeks later, placing third at 71 kilograms. Another rehabilitation process soon became the priority and next thing you knew, he was off the mat for six more months. With his shoulders once again in working order, Perkins swooped back into action last week gunning for his third straight Schultz title. There were some differences abound. The first and most obvious was his weight class. Originally a 66 kilogram competitor before jumping to 71 over the winter, Perkins went up to (the amended) 77 kilos, partly because it’s the Olympic weight class and partly because of the new weigh-in format. Because of this, the native Nebraskan appeared larger than at any time previously, though stylistically he certainly seemed like the same guy (despite the hair cut). In addition, for the first time in a few years Perkins was not the weight class favorite. That distinction belonged to 2012 Olympic/2013 World champ Kim Hyeon-Woo (KOR), one of Greco-Roman’s biggest global stars. After eeking past 2016 World Team member Chris Gonzalez (NYAC) in the semis, Perkins and Kim met in the finals with the Korean emerging victorious via an 8-0 tech fall that was more competitive than what the scoreboard betrayed. Since we pointed a spotlight on Perkins leading up to the Dave Schultz Memorial, we also wanted to check in with him now that it’s over. 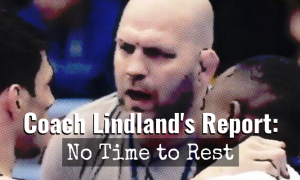 Topics on the table — his health, the new weight class, his thoughts on the final versus Kim, and what his plan will look like going up against other top guys at 77 in the future. “To me, they were 100%, they were good. Before the tournament even started, I went to warm up and I don’t usually think like this, but this has been happening to me the past two years, injury after injury. So before I even go into the event to warm up I’m thinking, I hope I can hold up just enough to where I’m at least 90%. But my shoulders felt like 95% going into the warm-up. I didn’t have any problems with it. This was the first time since 2016 that I’ve actually been this close to 100%, you know? Since the Olympic Trials in 2016. “I’ve never been down mentally, but the World Team Trials this past year, I felt my mental go down a little bit because I knew I was going into the tournament injured. But for this tournament, after my warm-up I was like, I’m happy to be here close to 100%. Chris Gonzalez and I warmed up together and I’m able to hit moves, I’m able to pummel right, and having no problem. It was just an amazing feeling, and it boosted my confidence and made my body just feel so good. “Going up, I felt strong, I felt the strongest I’ve ever been, and I can say that after dealing with all of the injuries. I felt strong at 66, too, but I felt a lot stronger being at 77. Once I had my first two matches and I felt those guys kind of backing up away from me, that’s when I figured, This isn’t a difference at all compared to what I normally wrestle at because these guys are backing away from me, so I’m sure they feel how strong I am. That was also a confidence booster. “Going into the match, you know how it is, I’m sure you talked to a lot of people. Me being from the US, no World medals, no Olympic medals or anything like that, and I’m going up against one of the top Greco wrestlers in the World, to me, at any weight — you have all these people coming up to you saying, He’s going to do this, he’s going to do that, so YOU need to do this and YOU need to do that. I feel like I was taking in too much advice from people instead of just wrestling how I wrestle. I kind of feel like I respected him too much. “Everybody knows he’s going to push the pace. He’s going for the arm throw, everybody knows that. And people are coming up to me like, You need to hold onto him. It kind of felt like there were stall tactics to keep the match close. I feel like I could have worked on my moves a little more. Just like you said, I got to the underhook and he backed out of it. That’s the type of wrestler I am, I’m going in there and trying to get underhooks. I’m trying to go big, that’s what I want to do. “I just have to go into the match knowing I can beat this guy, knowing that he is just another guy. Other people, they have to know that, too. They have to know what I’m capable of and they can’t just come up to me saying He’s going to do this… It’s like, Okay, he’s going to do that, but I’m going to do THIS. I have to stop him, he has to stop me. I have to block some stuff off and just go in there and do what I have to do. “At the same time, I take a little stuff in, but I am still going to go in there and wrestle like myself. As I said, he’s one of the top guys at any weight, so I just wrestled one of the best guys at any weight. Yeah, he tech’ed me, but it didn’t look as bad as it sounds. To me it didn’t. I just wrestled a top guy, but I’m not going to look at any of these other guys and say, He did this or He did that. I just wrestled a World and Olympic champ.